Kotobukiya is back with the first new Rockman model kit in several years: the Irregular Hunter himself, X! A prototype mold of the completed kit just made an appearance at the 2019 Winter Wonder Festival. 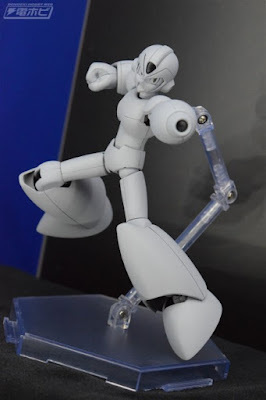 Just like previous Rockman Kotobukiya kits, X comes with three face parts, three hand parts (X Buster included), and several points of articulation. The kit is expected to launch worldwide later this year. Price is TBD. More news soon! I hope they would've made an actual figure not a kit but, why not it looks awesome. Zero did'nt ever kill any line, bub. he just is the last eligible character in line, which mean every serie end with him because they have no other character "worth" making. (read, others characters with enough guaranteed sales to make it not to risky to make). hence why they're going back to X to make another figure instead of a another character. Now who knox, maybe if Megaman become mainstream anough, we might get Axl or someone else. I thought Mega Man Zero killed the line. Oh wait they continued with X and will probably stop when the core characters are used up like others speculated. 5 inches, 1/10 scale. Is X THAT short? i also remember him being 160 cm tall. 160cm is his official height, but you also gotta understand that's not tall in the slightest. He's almost kid-sized (also one of the reasons Mavericks occasionally call him a kid). Not only is he small, but officially he's meant to be a 14 or 15 year old. Anonymous 4:37 AM: No he's not, stop making things up. You don't train a 14 year old to be the next carrier of moral, ethical, intellectual and straight up powerful arbitration between human and A.I machine on a large scale by himself for hundreds of years. A 14yo doesn't essentially join a police force aimed at dealing with violent crimes, wars, espionage and other sophisticated affairs. X is literally hundreds of years old, and based on his attitude, demeanor, role, circumstances, actions everything, he doesn't seem like he is "meant to be" a day younger than that. Now you can say he looks 14(his age looks ambiguous to me personally, he just looks like a young anime man), maybe that's what you meant. 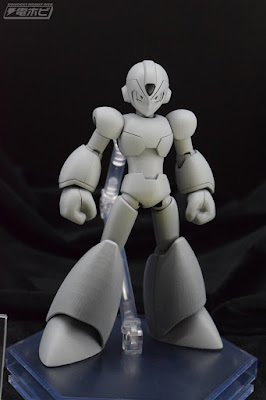 While I have enough X figures to keep me set, this sculpt looks pretty clean. I've got plenty of unarmored X figures, but I'm always up for a Kotobukiya model kit. Looks decent, i'll probably get it when it's released. I hope they do a x1 and x3 Zero as well and some of the Mavericks like Vile in his x3 form, Bit, Byte, Sigma or even the X Hunters. It looks ok, but i'm not a fan of the fact that they went with the x5-x7 style short stubby arms and huge hands proportions. Sweet! :D I'd been waiting for X ever since the original kits were released. This looks great. I hope it's not as fragile as the previous Mega Man kotobukiya kits. Are they worth getting at this point? I was thinking of getting the Protoman kit sometime. I got both Mega Man and Proto Man. They look cool, aside from them being fragile. If you can get them at a cheap price, go for it, but if you buy it for more than 50 dollars, you are getting ripped off.